I'll just leave the full descriptions here so you know which story I'm referring to when I submit these. George A. Romero was originally attached to writing/directing the live action films but eventually the project was given to Paul W.S. Anderson. Romero had previously made the live action trailer for RE2. There was once a project to create a Resident Evil game featuring ninjas. The game was to be set in a house filled with traps and hidden doors, much like the mansion in the first game but only set in Japan's Sengoku period. The characters were also supposed to be able to use ninja techniques. Eventually the project got turned into Onimusha. In the police station on scenario 'A', when the player meets "Marvin Branagh" who is resting on a locker, the name tag on the locker says "JoJo". This is a reference to "JoJo's Bizarre Adventure", to either the nickname of the main protagonists from their "Part" series who are called JoJo or Capcom's JoJo's Bizarre Adventure (1998), which came out on the same year as "Resident Evil 2" did. In the police station on scenario 'A', when the player meets "Marvin Branagh" who is resting on a locker, the name tag on the locker says "JoJo". This is a reference to "JoJo's Bizarre Adventure", to either the nickname of the protagonist who are called JoJo or Capcom's JoJo's Bizarre Adventure (1998), which came out on the same year as "Resident Evil 2" did. Not to discredit your sources or anything but that video is pretty terrible, it doesn't even show the locker. I don't know if you used a picture of it as an attachment but I'll just leave one (from the GC version) here. I read that two of the police station's K9's were named Rocket and Jojo, though I could not find any images. I got an image, but this one's better, thanks. We know who is "JoJo", but who is "Rocket"? Could you show us an image please. (10-09-2016, 06:51 AM)Kakariko Kid Wrote: I read that two of the police station's K9's were named Rocket and Jojo, though I could not find any images. That information is from a Resident Evil 2 strategy guide. I haven't actually checked the names myself but I can do that once I get back to my Dreamcast. I can only assume the quality won't be the crispest possible. This is the text from the actual guide: "you can see the names of the first two dogs locked in the kennels: Rocket (below) and JoJo (above)." Sadly I don't actually have the guide itself, I just copied that from an online transcript. In RE7, which place is it when Lucas Baker dragged that guy into that place? And is that the inventory sound effects from RE3? For the first thing, that's not trivia worthy. It's part of the game and you go there as Ethan later on. You will also find Clancy (the guy being dragged in the video) near there. Those sound effects are not just from RE3. They used the same sound effects in all RE games from 1 to Code: Veronica. It is a kind of an easter egg in RE7, though. Sorry I didn't reply to you on time. But, I think this is more accurate. —Were there other things, like the torches you just mentioned, that the staff added as little jokes or Easter eggs? Kamiya: Supposedly an image of my face is hidden in there somewhere, although I have no idea where it is myself. (laughs) I think it might not even be in the game itself. Also, if you read the signs around town in reverse, they’re the names of the developers and of Street Fighter II characters. The poster for the watch was them joking around too, “this is the #1 best selling watch in the world!” Also, in the back of the locker that contains the submachinegun and backpack, there’s a poster of one of the popular characters from the Biohazard TV anime. And when the window gets broken in the weapons shop, you can see the characters 兼人 (“Kaneto”) written on the side of the parked car outside. —Oh, I always thought those characters were 無人 (“mujin”, unmanned / empty). 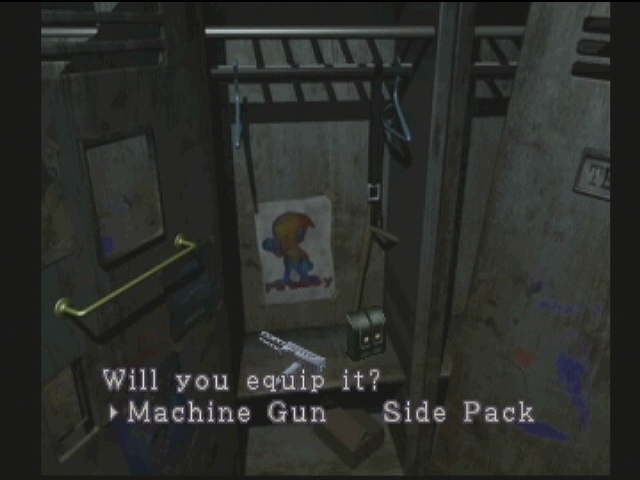 (02-25-2017, 03:28 PM)ProtoSnake Wrote: Also, in the back of the locker that contains the submachinegun and backpack, there’s a poster of one of the popular characters from the Biohazard TV anime. A what? What were these people talking about? Resident Evil never had an anime series and I couldn't find a series of the same name that would have existed either. Could ask Hideki what's he on about. It also might be a small mistranslation, as the thing inside the locker is a "side pack" for the belt of the character, not a backpack. (04-26-2017, 10:25 AM)Mass Distraction Wrote: A what? What were these people talking about? Resident Evil never had an anime series and I couldn't find a series of the same name that would have existed either. I guess you're right. That guy who translated it, needs to relook at it just in case. Thank you for your help, dude. During the final boss on the HD Remastered version, when Chris Redfield or Jill Valentine uses the Rocket Launcher to finish off the Tyrant, the HD version's explosion covers up the Tyrant's remains. Just to clarify, is the top video footage from the GC remake and the bottom video from the HD remaster? Current time: 04-18-2019, 08:03 AM Powered By MyBB, © 2002-2019 MyBB Group.